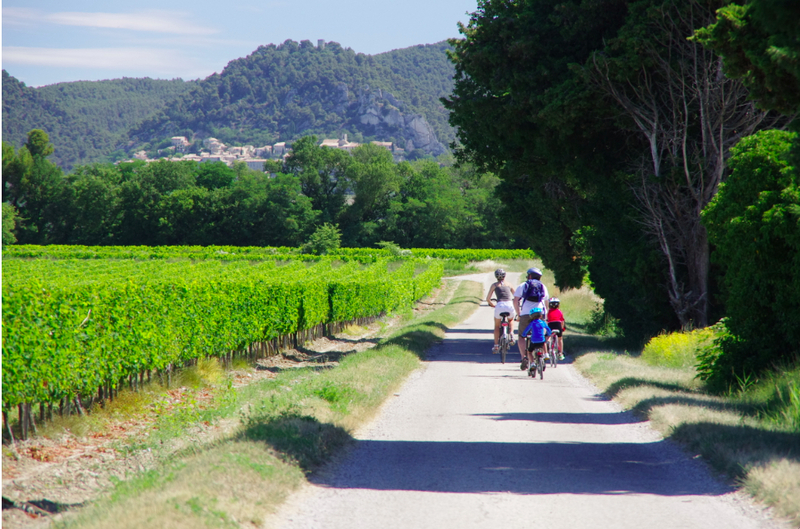 While David Millar was riding his way west from the Alps I was having a grand time in Vaucluse (northern Provence). I started the morning out with a large mug of coffee and a small baguette. 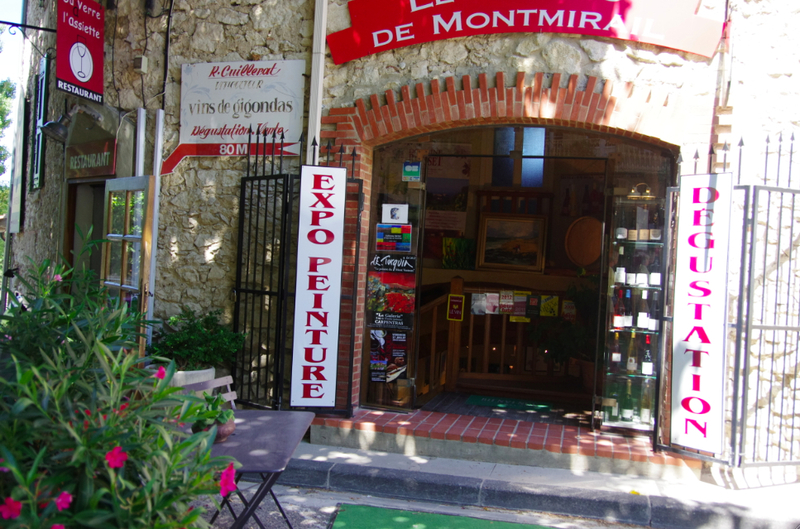 I ventured out on a loop driving tour of the nearby villages in the wine-region (highly recommended). 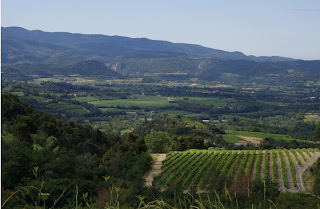 I drove through Vaison-la-Romaine (I had been before, but please note they have a nice Roman museum and Roman ruins) and Seguret (I had also been before to this interesting hillside town). 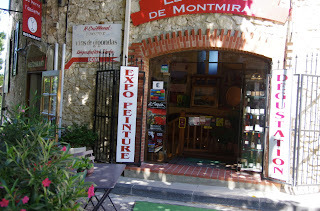 The next town on the loop was Sablet, where I stopped at the morning market and bought 4 delicious apricots. 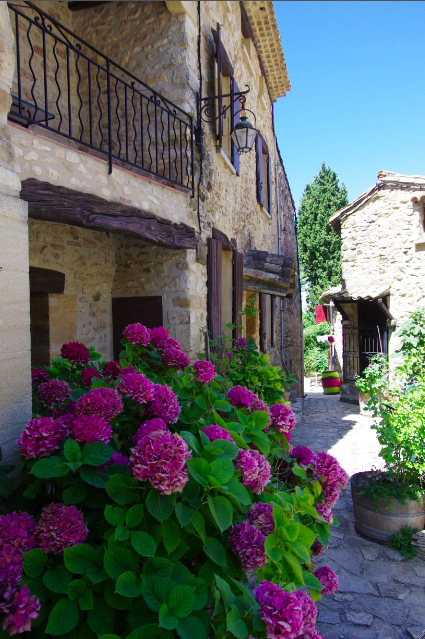 Gigondas was next on the loop drive, and I loved this town. 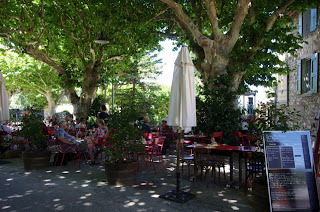 With several cafes set outside under shade trees and at least four wine-tasting rooms, this terraced town was a delight. The roads were peppered with cyclists on this loop and I longed to be on my bike. 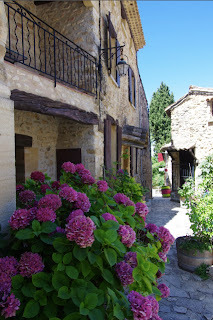 Further down the road, Baume was another very pretty town. 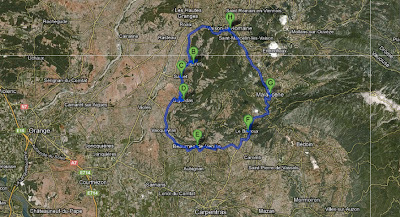 Both motorists and cyclists can continue on the road to Malaucene (known as the 3rd route to Mont Ventoux) to complete the loop back to Vaison-la-Romain. 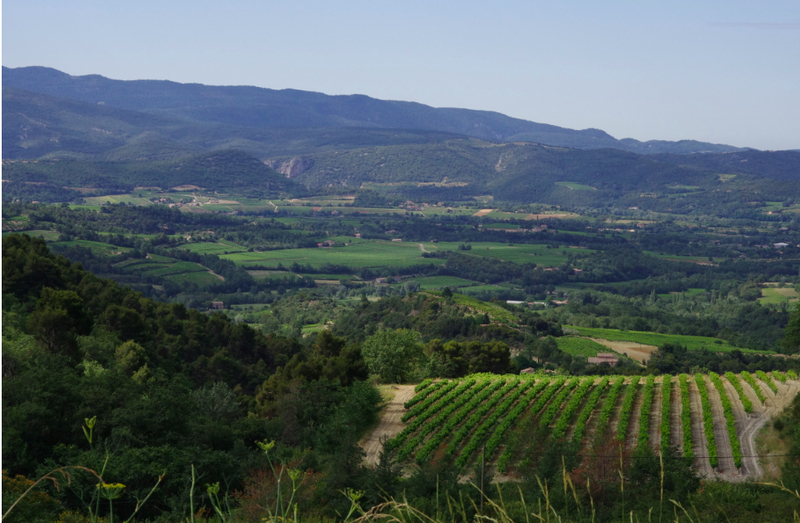 I liked this area a lot, I dare to say more than the Luberon. After seeing such beauty it was time to hop on the autoroute and head to the finish of Stage 12 of the Tour de France. I did not hear another word of English from any other fan at this stage. 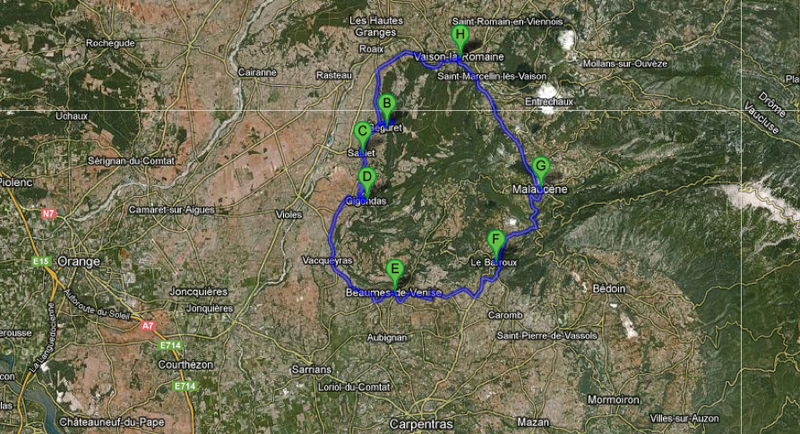 Deep in the Rhone River Valley, the finish was in Annonay, which I will forever remember as onlyoneway into town. Believe me I tried and met every direction interrupted road sign on the way there. I never really saw the town of Annonay, the stage finished in the blue collar area on the outskirts of town. Sometimes I wonder if the arriving riders think - I rode all the way for this? The Alps were a long way away, barely even visible over the horizon. Never mind, the Tour de France is still fun and I got a taste of a real French stage finish. The last semi-flat break-away finish I had seen of the Tour de France was in Bordeaux in 2003, and guess who I had dinner with that night - Allan Peiper. And guess where he is now - DS of Garmin-Sharp. He's done pretty well for himself I'd say, and his boy David Millar won today! David Millar! I couldn't see David after the stage because a pile of press were gathered around what I thought must be him, only I failed to look on the ground where apparently David was lying, 'cuz I wasn't expecting a heap of David since seconds before I had seen David zoom over the finish line looking like he was capable of standing upright. I'm wondering if all those press started asking David questions like, "David how does it feel to win a stage off of drugs, and David do you plan to do it again and when?" Those are the types of fascinating questions launched by cycling press. I think that is why David was laying on the ground, because he didn't want his moment of glory ruined by stupid questions. I enjoyed seeing all the riders come out of the shute just past the finish line. As a fan I could stand there and recognize nearly every rider as they passed by on their bike, only inches away. So many references have been made to how cycling fans can get close to the athletes, I prefer the references to "participation" as a fan best, but it truly is magical being at the Tour in person. This is not a scene on TV, no required numbered stadium seats are necessary, no polite hush from the crowd before a serve or kick - this is in your face sports. Being at the Tour de France consumes all the senses and I am thrilled to be here. Oops, I fell asleep uploading pictures last night. Then I chatted with my host at the Bed and Breakfast, Patrick Ceerdan, who happens to be a former French Motocross Champion, mountain biker and avid outdoors man. I also met a very nice family of 9 from the Netherlands at breakfast. 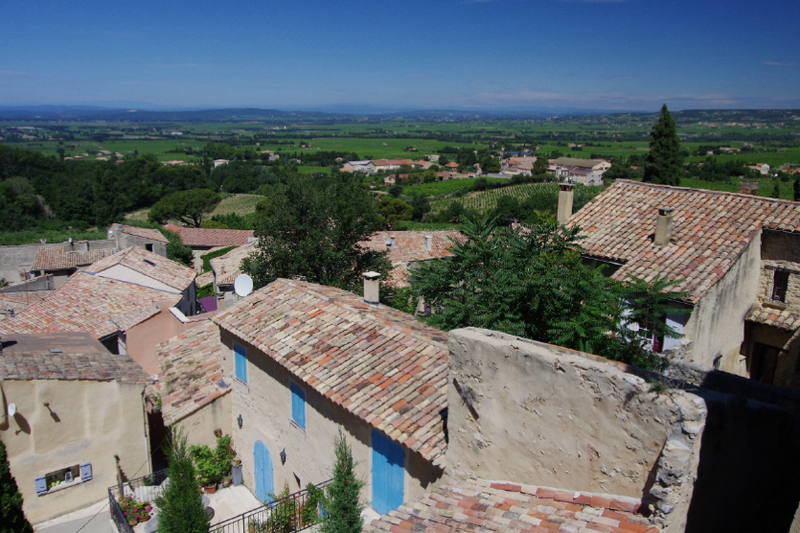 They are headed to Isle-sur-la-sorgue where they rented a house for 14 family members for a two-week vacation. I am now headed to Stage 13, so will upload photos of Stage 12 and 13 later, also my travel stories and photos.